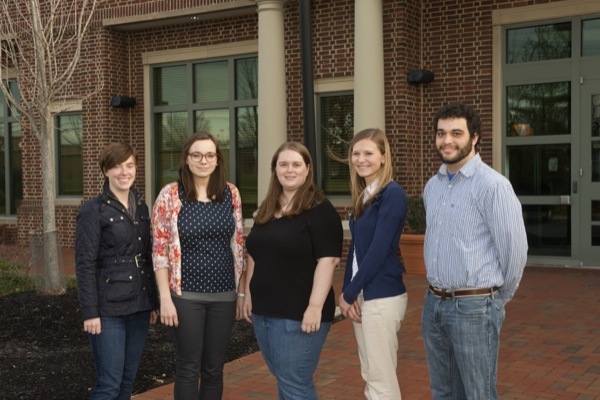 Pictured are IGERT Scholars (from left) Lisa Sawicki, Stephanie Luff, Julie Cowart, Jen Niemczyk and Aidan Zerdoum. 2:04 p.m., Dec. 18, 2012--The Delaware Biotechnology Institute (DBI) hosted a reception Tuesday, Dec. 11, for the first cohort of five IGERT Scholars participating in the new National Science Foundation-supported Integrative Graduate Education and Research Traineeship (IGERT) program awarded to principal investigator Kelvin Lee, Gore Professor of Chemical and Biomolecular Engineering at the University of Delaware (UD) and director of DBI. The Systems Biology of Cells in Engineered Environments (SBE2) five-year, $3 million grant will teach the IGERT Scholars critical skills related to science and engineering, as well as bioethics, research ethics, business innovation, communications and outreach. They will be trained through a multidisciplinary curriculum to become world leaders in industry, government and academia. "We are excited by the motivation and quality of the students in this first group of SBE2 IGERT Scholars,” says Lee. “We look forward to the their contributions as innovators in the bioscience community and to society as a whole." The reception was an opportunity for the first group of IGERT Scholars to meet and mingle with their contemporaries as well as the UD faculty who are helping shape their program. This grant will bring together experts across the University in the colleges of Engineering, Agriculture and Natural Resources, Earth, Ocean, and Environment, Arts and Sciences, and the Alfred Lerner College of Business and Economics for a comprehensive, intense work/study program designed to create the science leaders of tomorrow. Co-principal investigators include Cathy Wu, Edward G. Jefferson Chair of Bioinformatics and Computational Biology; Kristi Kiick, deputy dean and professor in the Department of Materials Science and Engineering and biomedical engineering; Thomas Hanson, associate professor of marine biosciences and biological sciences; and Jia Song, assistant professor of biological sciences. Each scholar will embark on their SBE2 IGERT curriculum in January, and for two years will conduct rotations in faculty laboratories, participate in industry internships and do work in laboratories in Delaware and around the country, as well as design and implement solutions to important industry problems. Each scholar is awarded a $30,000 stipend and given the opportunity to work with similar-minded classmates in different disciplines, and the diverse curriculum that is the basis for the SBE2 IGERT program. “I’m interested in the multi-disciplinary approach of the IGERT program, the focus on sharing knowledge between laboratories, and the field experience with industry internships,” says Aidan Zerdoum, SBE2 IGERT Scholar and first year doctoral student in biomedical engineering at UD. The commencement of the IGERT program corresponds with the launch of a new Ph.D. program in bioinformatics and systems biology. Julie Cowart, a first year doctoral student in the new bioinformatics and systems biology degree program, recognizes the opportunity to be a pioneer within both of these new programs.